Necklace by Reluxe is up cycled, being re-stocked soon here; Gold (recycled) rings: w/ band of diamonds by Brilliant Earth, w/ diamond solitaire by behindtherockz on Etsy; w/ topaz by Christine Mighion on Etsy; cuff by Kora is fair trade and available from Juno and Jove; high-heel is vegan by Olsenhaus; flat is vegan by Qupid; envelope clutch is vegan and made from recycled materials by Matt and Nat; Camel organic cotton jacket by Kami, available at Yoox; Black see-through blouse is made in the USA by Carrie Parry, available from Juno and Jove; earrings are fair trade by Manumit. 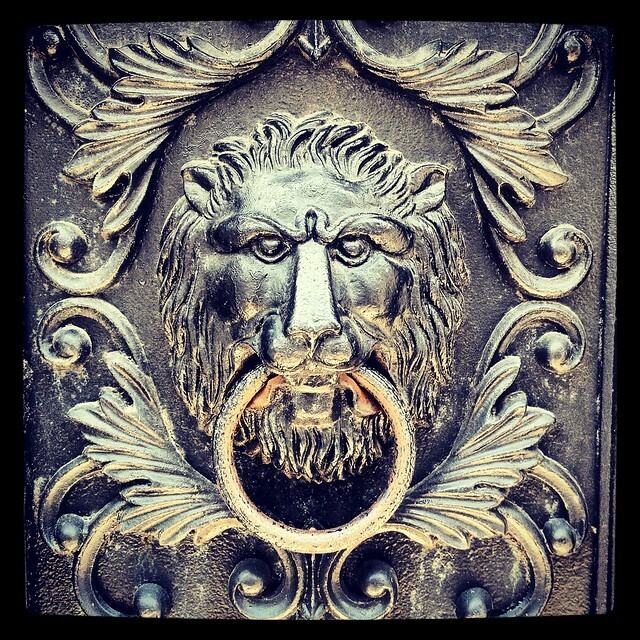 Doesn't that door-knocker look like Aslan? What does that have to do with this post? Nothing. But it totally looks like Aslan, you guys. I dunno about you, but as an obsessive fashion blog reader, I often find myself behind a desk thinking "I LOVE that, but girlfriend, I don't work in fashion, and there is no way that is office appropriate in my world." I am so jealous of the freedom that fashion people have, and maybe you are, too, so today, I put together a fun, elegant look that would be appropriate in almost any office while also being kind to people and planet. If it's cooler where you are, or if you work in sub-zero air conditioning, ze jackets are your friend. And that beautiful gold zippered shirt from Amour Vert is extra fair bc it's one of those shirts you can tuck in and put under a blazer for work, or un-tuck and wear with crazy harem pants on the weekend. Last point-- while I was putting this together, I was listening to Sam Sparro's Black and Gold on repeat, so if you end up wearing black and gold this week, I recommend strutting about your office with this song in your head, imagining a cast of tuxedo-clad men doing a back-up dance for you. Today I featured a piece from a new company that was just introduced to me by my talented friend Aaryn West. Amour Vert was founded to prove that "it is possible to be both fashionable and environmentally responsible." You know I'm lovin' it, but what's more, they provide a detailed breakdown of each fabric used by the lines they carry, from hemp to organic cotton to modal--check it out! This line is produced ethically and locally in the New York garment district, sourcing environmentally conscious materials and textiles supporting artisanal communities worldwide. Ever wonder what peace silk is? Me too. Designed and sewn in California, the vegetable-dyed black tank from Vivaterra is made from silk harvested humanely in Southern India using a technique that spares the silkworm. Aha! So nice to meet you last night. Great blog concept!